Padraic Maher (Thurles Sarsfields) and Conor Cooney (St Thomas) had a good day on the club front. REIGNING CHAMPIONS THURLES Sarsfields are through to this year’s Tipperary senior hurling semi-finals after the weekend’s action and they will be joined by Killenaule, Clonoulty-Rossmore and Kiladangan in the last four. Pa Bourke and Richie Ruth both hit the net as Thurles Sarsfields claimed a 15-point win yesterday over Borris-Ileigh, who had Tipperary All-Ireland winning captain Brendan Maher in their ranks. John O’Dwyer’s Killenaule secured a three-point win over Kilruane McDonaghs while today at Semple Stadium there were wins for West champions Clonoulty-Rossmore and North champions Kiladangan, the latter knocking out 2011 title holders Drom-Inch. In Galway, the senior hurling final will be contested by 2013 All-Ireland club winners St Thomas and the 2014 Galway champions Gort after today’s semi-finals. St Thomas saw off Loughrea by five points while Gort defeated last year’s finalists Craughwell by two points. In Offaly, it will be a first meeting of Birr and St Rynagh’s in the senior hurling showpiece since 2001 while Leinster club kingpins Oulart-the-Ballagh will take on Cloughbawn in the Wexford decider. 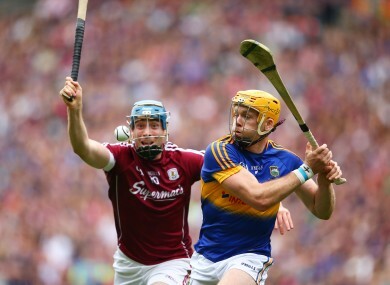 Email “Tipperary senior hurling last four confirmed as St Thomas and Gort reach Galway decider”. Feedback on “Tipperary senior hurling last four confirmed as St Thomas and Gort reach Galway decider”.